Home / Social Meida / Will Facebook reaction affect SEO? 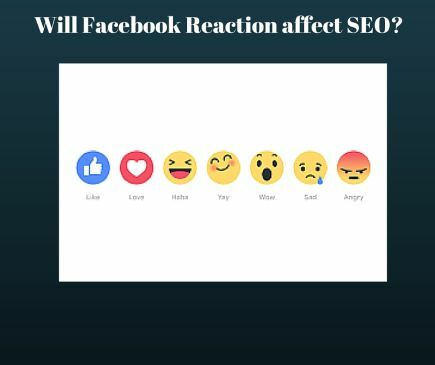 Will Facebook reaction affect SEO? Facebook has launched a new feature “Facebook reaction”. The feature enables the users to express their views on a post with smileys. You can choose like, love, haha, ho-ho and smiley to react on a post. The integration of multiple reactions has given rise to a new topic. People are curious to know whether a post with many “Angry” emoticon affects their search engine ranking. A discussion begins that will Facebook reaction affect SEO in future? The answer is a big “no”. The reactions have no relation with search engine rankings. A) Google has already mentioned that they have stopped ranking websites on the basis of likes, comments, and shares. According to them, getting likes, comments, and shares is an easy game now. They have tested this factor but these factors fail to offer reliable results. B) Reddit came with two buttons like and dislike. Many Reddit bookmarks with negative feedback(dislikes) are performing well in search engine results. So, there is no relation of likes and dislikes with search engine ranking now. C) Single call-to-action button: – Facebook is offering “Facebook reaction” feature with a single call-to-action button. Search engine algorithms and tools will count total likes only. No matter what are the reactions of the people. So, have a coffee and relax. The new feature is not going to increase your headache. Your website won’t be affected by it.